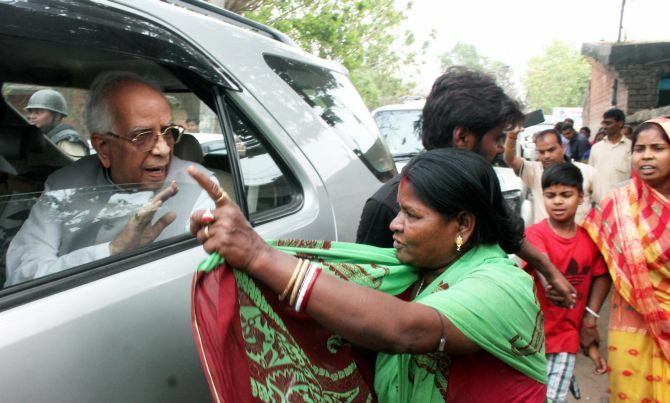 Governor Keshari Nath Tripathi had on Saturday paid a visit to the violence-hit areas of Asansol and Raniganj. Defying the state government's prohibitory orders, a Bharatiya Janata Party delegation on Sunday visited violence-hit Asansol to take stock of the situation there after last week's Ram Navami violence. The four-member BJP delegation, led by its national spokesperson Shahnawaz Hussain, visited Asansol amid tight security and were joined by the local BJP leaders at relief camps. After returning to Kolkata, Hussain blamed the Trinamool Congress government for 'having failed' to control the situation in the Asansol-Raniganj belt of West Burdwan district and said, "It (the government) has played the role of a mute observer." "We visited relief camps in Asansol and found that whatever had happened was wrong. It was a failure on the part of the state government," he told reporters. Hussain said the delegation will submit to BJP chief Amit Shah on Monday a report on whatever they observed in Asansol. The delegation had been formed by the BJP chief. Besides Hussain, the delegation included BJP national vice-president and Rajya Sabha member Om Prakash Mathur, Palamu MP and former director general of Jharkhand police Vishnu Dayal Ram and Rajya Sabha member Roopa Ganguly. "We want the administration to take strict action against the culprits responsible for the riots here," Mathur said. On the way to the coal town of Asansol, the delegation was first stopped by the police at Basra More and then near Kalipahari as prohibitory orders were in force in the area. The BJP leaders, however stuck to their plans and proceeded to Asansol. The Mamata Banerjee government had yesterday said it would not allow the BJP team to visit the coal towns of Asansol and Raniganj as prohibitory orders under section 144, Code of Criminal Procedure were in force in the riot-hit towns. It had also said that with the dates for the panchayat polls announced and the model code of conduct being in force, it would not be able to provide ample security for the BJP delegation visiting Asansol. He had held a meeting with senior officials of the police and administration and appealed for peace. The Asansol-Raniganj belt had witnessed clashes between two groups over Ram Navami celebrations, resulting in the death of one person. Two police officers too were injured in the clashes. The internet services remained suspended in both the towns, a senior police officer said. What has Nitish Kumar done to stop communal violence?